What Will I Learn in My Online Master’s in Accounting Program? Do I Need to Take the GRE or GMAT to Enroll in an Online Master’s in Accounting Program? Accountants manage the financial pictures and futures for companies large and small, private and public. With a robust economy and shifting financial regulations, professionals who can manage the micro and macro finances of an organization are increasingly in-demand. Bureau of Labor Statistics indicates that roles for accountants and auditors are set to grow faster than the national average, with nearly 11% growth over the next decade. An accounting degree allows you to work in nearly any type of industry or field you desire. While graduates may take traditional accounting positions in tax firms, accountants are needed in areas as diverse as technology, retail, and law. In fact, accountants make up approximately 15% of all staff employed by the FBI. No matter where your interests lie, a degree in accounting provides graduates a bright future. Time to Complete Traditional and accelerated programs are available to students seeking a master’s in accounting online, with an average completion time between 12 and 24 months. Credit Hours Approximately 30 credits. Additional Considerations Some programs may provide an elective internship that allows students to gain first-hand experience in an accounting firm or other business. Located in Boiler Springs, NC, Gardner-Webb emphasizes balancing of faith and intellectual freedom towards a life of love, leadership, and compassion. The school offers many remote programs of study, including a master's degree in accounting online that focuses on applied economics and financial practices, while also highlighting leadership and business decision-making skills. The 30-credit curriculum comprises 15 hours of core coursework (including a capstone in auditing) and 15 hours of electives drawn from areas of focus like general accounting and forensics. Various forms of aid are available, including loans and grants, employer reimbursement, and graduate assistantships. Gardner-Webb also offers a dual master's program in business and nursing or divinity, allowing those interested to gain a wide but connected array of skills to pursue their professional goals. A non-traditional and non-profit school founded by entrepreneurs and philanthropic visionaries in 1998, Touro University Worldwide houses its headquarters in Los Alamitos, CA. TUW's mission welcomes all cultures and backgrounds and emphasizes social justice and a global viewpoint. Accredited by the Western Association of Schools and Colleges (WASC), Touro offers an exclusively online education, including an MBA. Totaling 36 credit hours, this MBA curriculum combines core and concentrated coursework along with a senior capstone project. Students can choose from five concentrations, including accounting, to align their academic pursuits with career goals. Students have the option of finishing the degree in one year if they take two courses per two-month term, consecutively. Tuition is $500 per credit hour and TUW scholarship advisors work with applicants to bring that cost down through a combination of federal, institutional, and community scholarships; many graduate students pay less than $10,000 for their degree, making TUW's an extremely affordable online master's degree in accounting. Established in 1889 by the Order of Saint Benedict of Florida, Saint Leo's on-campus and online degree programs are accredited by the Southern Association of College and Schools. SLU offers a robust remote learning experience through its platform eLion, and offers a variety of graduate programs, including an online accounting master's degree within a business administration framework. Courses focus on topics including fund accounting, business law, financial statement analysis, and fraud examination. Those motivated to get through the program quickly can opt for the accelerated MBA track, taking two courses each eight-week term continuously for six terms. This track can be completed in a year. SLU is known as one of the most military-friendly universities in the country. Not only do personnel receive reduced tuition across the board, but they also have access to a large number of grants and scholarships. Founded in 1878, Brenau is located in Gainesville, GA. The institution prides itself on fostering a desire for intellectual and artistic accomplishments in its students through a curriculum enriched by liberal arts, scientific inquiry, and global awareness. Brenau houses a catalog of 555 graduate programs, and those wanting to pursue a master's degree in accounting online can do so through the school's MBA track. This 15-course, 45-credit hour program consists of courses in applied economics, business strategies, and international finance. In addition, students can choose to specialize in two fields: public accounting and management accounting. Online learning is facilitated through the Canvas platform. Tutoring, counseling, and career service support are open to all students. Baker College, located in Flint, Michigan, was formed in 1965 through the joining of two institutions: Muskegon College and Baker Business University. Today Baker is the largest, independent, not-for-profit university in the state and prioritizes it mission based on 11 principles, including community orientation and a willingness to change and adapt. All of Baker's programs, including its master's degree in accounting online, are accredited by The Higher Learning Commission. Baker's MBA in accounting focuses on providing an in-depth, practical understanding of theoretical and applied concepts. The program is ideal for those with accounting experience looking to gain managerial knowledge and skills critical for their work situation. In addition to student services such as tutoring and financial assistance, Baker offers lifetime employment assistance to its graduates. Located in titular Alabama city, Auburn opened its doors in 1859 as a private liberal arts institution, only to close two years later due to the Civil War. Auburn reopened after the war and is today one of the preeminent comprehensive universities in the country, offering degree programs for traditional and nontraditional students. Among the nontraditional options is an online master of accountancy (MAcc). This accounting master's degree online program consists of courses such as integrated accounting applications and government & not-for-profit accounting. Those who want to pursue the MAcc program but are lacking previous academic credentials can opt for Auburn's accounting bridge program, which takes students through necessary prerequisite courses. Though they do not earn an undergraduate degree for this work, students are eligible for scholarships during their time in the bridge program. A network of support is available to online students, including financial aid assistance, tutoring and advising, and student/professional organizations. SUNY Poly's mission is to provide higher education that is affordable and innovative in order to prepare graduates for technologically-driven and globally-focused careers. The university offers several online degree programs, including an MS in accountancy, which consists of 11 courses (or 33 credit hours). Graduates are qualified to sit for the New York CPA (Certified Public Accountant) and CMA (Certified Management Accountant) exams. The curriculum covers topics such as auditing theory, management information systems, and multinational economics. Online accounting master's degree courses are conducted through the Blackboard learning platform. Financial aid, including paid assistantships, is widely available. Online graduates leave with degrees from the brick-and-mortar college where the program is held, making their accreditation identical to their campus counterparts. Though UML has roots that date back to the 1890s, the current iteration of the school was formed in 1972 through the merger between Lowell State College and Lowell Technological Institute. Today, UML is a public research institution that offers affordable and accessible education to all persons. Many remote programs are available, including an online accounting master's degree program. Housed in the Manning School of Business and part of the Division of Online & Continuing Education, the MSA prepares students for high-level positions in public accounting. The 30-credit curriculum includes courses in forensic accounting and corporate finance. Students in the program pay $640 per credit regardless of residential status. Online students have access to much of the same support their campus counterparts enjoy, including tutoring, academic advising, career assistance through Jobhawk, and 24/7 technical help. Located in Nebraska, Bellevue focuses on designing programs that satisfy the performance outcomes defined by professional and industry standards. Among the school's many innovative and flexible options are two online accounting master's degree programs: a MBA with a specialization in accounting, and an MS in accountancy. Both programs consist of 13 courses (36 credit hours) and cover topics like financial management, auditing, and operations & logistics theory. While both degrees prepare students for a fast-paced and competitive job market, the MBA program focuses more on managerial and communication skills, while the MSA focuses on deep accounting practices like internal information systems. Both programs are accredited by the Higher Learning Commission and tuition is the same: $545 per credit hour. Transfer work is accepted and students can also get credits towards their degree through Bellevue's prior learning assessment program. Originally founded as Marion College in 1920, IWU is dedicated to providing liberal arts and professional education for all students. The school was one of the first to cater its degree programs to nontraditional and working adult students in 1985, and this dedication continues today through its 38 graduate programs, including an accounting master's degree online. Taking 18-26 months to complete, the MSA program integrates knowledge of field standards and practices with the ability to design and communicate strategies towards implementation. Courses include corporate taxation and forensic accounting & fraud examination. Financial Aid is applied for through FAFSA, and employer assistance/reimbursement is available. Pastoral discounts are also available, and active military personnel receive a 25% discount on all graduate tuition, among other benefits. Founded in 1873 and Located in the city of Rome, Shorter University is a Georgia Baptist Institution with a history of offering an excellent liberal arts education. The school's MAcc degree can be completed in as few as 12 months. Graduates of the program are eligible to take the CPA Exam. Consisting of 31 credits, the curriculum covers topics like legal issues, ethical practices, and accounting information systems. Tuition is $500 per credit hour. Active military and veterans receive discounts and other aid; they can also ask the university to assess their military training and experience in order to receive college credit. Concordia University specializes in online education, especially for working adults. Concordia is accredited by the Higher Learning Commission, and its business programs are backed by the International Assembly for Collegiate Business Education (IACBE). Among the school's many graduate offerings is an MBA in accounting, a 39-hour program. Unlike many other MBA programs, Concordia's does not require applicants to take the GRE or GMAT. The curriculum includes courses in applied statistical methods and management; students are required to take on an internship during their time in the program. Graduates leave with a strong foundation in business and essential skills including auditing and systems management and design. UMass-Amherst is part of the UMassOnline system, created in 2001 by the university president and board of trustees to meet the educational needs of busy individuals in the state and nationally. Among the graduate program offerings is an MSA, which can be completed entirely online or through classroom work at Amherst's Isenberg School of Business. The program is designed for those with an undergraduate degree in accounting, and many students graduate in two semesters. The 30-credit curriculum consists of seven core courses and three elective classes, covering topics like advanced auditing and business tax decisions. Students can apply for financial aid through FAFSA and a variety of assistance is available, including grants, loans, and tuition waivers for MA state employees and other eligible individuals. Located in Denver, CO, Regis University was founded in 1877 by a group of exiled Italian Jesuits and is today one of 28 Jesuit colleges and universities in the U.S. Like other Jesuit schools, Regis's missions is based on care for the whole person, physically, emotionally, and spiritually, with a focus on social justice issues. Offered through the College of Business & Economics, the online MSA degree program is designed for those with academic and/or work experience in the field. This 30-credit program also includes an additional 10-15 credits in prerequisites. Those with the aforementioned knowledge and skill can test out of these courses, making Regis's MSA program suitable for a range of students and professionals. Military personnel receive a 15% discount on tuition and also have access to other assistance through G.I. bills and programs like the Yellow Ribbon Foundation. New England College, located in the quintessential New England town of Henniker, NH, was established in 1946 to serve the needs of military servicemen and women on the G.I. Bill after World War II. NEC promotes equal opportunities for all, and encourages the application of minority and women students to eliminate the effects of past discrimination in the provisions of educational and related services. NEC offers a 40-credit MSA, which prepares graduates for several professional certifications, including the CPA and CFE exams. Regionally accredited by the New England Association of Schools and Colleges, the MSA program can be completed in less than two years. With the flexibility of rolling admissions, students can enter the program every seven weeks. Located in Hobbs, New Mexico, USW was founded in 1962. As a Baptist institution, USW's mission focuses on the demonstration of faith through acts of service as well the freedom of thought and expression grounded in the separation of church and state. USW offers a variety of degree programs suited for students of all ages and backgrounds, including a master's degree in accounting online. Conducted through the Blackboard learning platform, the MBA with a concentration in accounting is a 36-credit program that can be completed in as few as 12 months and does not require a background in the field (though an undergraduate degree is compulsory). Courses cover topics like financial management, reporting, and leadership. USW's tuition is the same for all students regardless of residency status; tuition includes all fees and digital textbooks. Franklin University opened its doors in 1902 in Columbus, Ohio as a private, nonprofit university. The school is dedicated to providing working adults with an education that caters to their schedules and responsibilities, while also preparing them for entrance into or advancement in their preferred career. Franklin is a leader in online learning and offers a variety of degrees with multiple start dates and flexible 12- or 15-week course schedule options. Franklin's MSA program combines 21st century skills with the thorough teaching of technical accounting, research, and communication. The 30-credit curriculum builds on fundamental knowledge and skills, but also leaves room for students to pursue personal interests through either the taxation or financial operations tracks. MSA students pay $647 per credit hour and the program can be completed in as few as 18 months. Located in the city of Storrs, UConn opened its doors in 2001 as an agricultural school with a class of 13 students. Today, the school operates on several campuses throughout the state in addition to the eCampus, the school's online learning platform. Created with the Online Learning Consortium's Quality Framework in mind, UConn's remote degree programs combine flexibility with innovative communication to ensure that the quality of education does not differ from the traditional campus programs. Among the selection of degrees is the MSA. UConn's MSA program offers freedom in its curriculum; with only two required courses, students are able to design, with the help of advisors, the rest of the program to suit their academic, research, and professional goals. However, the program is best pursued by students with undergraduate credentials in accounting, as certain prerequisites must be met. SNHU, located in Manchester, was initially founded in 1932 as a school for accountants and secretaries. Today it comprises the School of Business, the School of Education, and the School of Arts and Sciences. Over 200 online degree programs are offered at SNHU, including an MSA with the choice of four concentration areas: auditing, taxation, forensic accounting, and management accounting. These options allow accounting master's degree online students to personalize their education, and the program has no GRE or GMAT requirements. Students can finish their MSA in 15 months by taking two courses per 10-week term. A wide array of support is available, including writing and other tutoring services, career advice, and disability services. Tuition is charged at $470 per credit hour for military personnel and $640 for civilians. Established in 1927 in Madison, Wisconsin as an independent institution, Edgewood College combines the Dominican Catholic belief in lifelong learning with the freedom and innovation of a liberal arts education. Edgewood is regionally accredited and its business programs are supported by the Association of Collegiate Business Schools and Programs. The school's online and hybrid degree programs are designed with the adult student in mind, as they focus on honoring past experiences and connecting you with peers in your industry. The MSA is a 30-credit degree program and consists of courses in management, taxation, and international business, to name a few. Students usually finish in two to three years, though those with the time can earn their MSA in as little as one year. Edgewood works with its accounting master's degree online students to make their education as affordable as possible, and accepts up to 12 qualifying transfer credits. Rutgers in Newark, New Jersey was established in 1766 and is the eighth oldest institution of higher education in the United States. Despite its age, Rutgers is on the cutting edge of alternative forms of education. Through its Center for Online and Hybrid Learning and Instructional Technologies (COHLIT), the offers a variety of graduate degree programs. Among the online catalog is the 30-hour (up to six can be transfer credits) MAcc in governmental accounting. Students can take courses part-time or finish in one year on a full-time basis. Graduates are eligible to sit for the New Jersey CPA exam. Those interested may also pursue the dual degree option that combines the MSA with a master of public administration (MPA), further strengthening the credentials for future work in government agencies. Tuition is $945 per credit hour, though various forms of financial aid can lower costs substantially. NSU was established in Ft. Lauderdale, Florida, amidst the turbulent and exciting changes of 1960s America. Today, NSU is considered a highly active research university by the prestigious Carnegie Foundation for the Advancement of Teaching. Pursuing innovation from day one, NSU offers an engaging catalog of online degree programs, all of which are accredited by the Southern Regional Education Board (SREB). Among the selection is the MSA, a 39-credit program designed for adults with work experience in the field. The curriculum is focused on value-driven management and consists of courses such as business law and regulatory issues for accountants. Those without prior knowledge or experience can take foundational courses online before enrolling in the MAcc program; those with solid grounding can get their degree in less than 21 months. Scholarships, like the Graduate Business Student Tuition Award, are available to online students. What started as a lecture series in a San Francisco YMCA during the 1850s would 50 years later become an evening law school and the first iteration of Golden Gate University. Today GGU continues that tradition, offering “quality, practice-based educational programs” for working adults in business and management, accounting, taxation, and law. It's no surprise then that GGU has an established remote platform and multiple online accounting master's degree programs, including the MAcc, the MSA, and the MBA with an accounting concentration. Credit requirements range from 30 to 54, and include core classes, electives, and specializations. Military personnel have access to additional forms of assistance through programs like Yellow Ribbon. Stetson was officially introduced in 1889, and eight years later the institution's School of Business opened, making it the oldest of its kind in Florida. Though Stetson has undergone many changes, the university's mission remains concrete: to create a lifelong love of learning in its students through personal growth, intellectual development, and global citizenship. Stetson's MAcc degree is accredited by the Association to Advance Collegiate Schools of Business (AACSB). Students can complete their degree in one year by taking 10 five-week courses completely online. The Stetson MAcc program prepares its students to sit the CPA exam, and nearly 100% of graduates land jobs shortly after finishing the program (if not before). Students are eligible for general financial aid as well as specific business awards like the Business Foundation Scholarship and the Professional Endeavor Scholarship. Located in New Haven, CT, Albertus Magnus was established by the Dominican Sisters of Peace in 1924 and the first classes were held a year later. Staying true to its Judeo-Christian heritage, AMC's mission is grounded in "providing opportunities for learning that responds to academic needs and ethical challenges of it students and society." The school offers an MSA degree, which consists of 30 credit hours and the option to pursue the personal financial specialist track. With accelerated eight-week courses and five starting points per year, students can finish the degree quickly while also catering to their busy personal schedules. Loans and grants are available through FAFSA to help fund tuition. Located in New York City, St. John's University was founded in 1870 by the Vincentian Fathers. Today it identifies as a coeducational Roman Catholic University with international campuses in Rome and Paris. Through the Peter J. Tobin School of Business, St. John's offers the MSA degree program, available on its campuses or online. This one-year, 33-credit program is designed to help those with experience in the field greater understand the function of accounting in their organization and in the global marketplace, enabling them to relate theoretical concepts to practical problems. Courses cover topics like forensic accounting, analysis of foreign investments, and internal auditing. St. John's offers tuition discounts and other forms of financial aid for active servicemen and women as well as veterans. Online master’s degrees in accounting provide distance learners with skills and frameworks to handle complex tax scenarios. An internship can also be a requirement for some of these programs. Accounting for Income Taxes: This course introduces taxation in individual earnings and addresses methods for solving various income tax issues accountants may encounter in private or public practice. Fraud and Forensic Accounting: Students learn to investigate legal issues related to complex fraud and other forensic accounting engagements. Topics also include detailing findings, valuation models, and testifying as an expert witness. Financial Statement Analysis and Valuation: This course covers financial statement creation, analysis, and valuation; and how bankers, auditors, creditors, and security analysts use the information in financial statements. International Finance: Accountants planning to work abroad, at multinational corporations, or within firms that have overseas clients benefit from this strategic course on global financial systems. Degree-seekers learn about foreign exchange markets, risk management, and international finance. Federal Income Taxation: This course introduces students to the types of federal income taxes paid by individuals, C & S corporations, and partnerships. The curriculum also covers methods of determining income, identifying deductions and credits, and expressing gains and losses. Accounting Information Systems: A blend of accounting and information technology, this concentration prepares graduates for 21st century roles in global, national, and local settings. Taxation: Designed for those planning to help individuals and companies prepare returns, manage tax liabilities, and consult with clients on the financial impacts of their decisions. Audit: This concentration is for students who wish to review existing tax records to ensure relevant laws and practices have been followed. While accountants are tasked with preparing tax filings, auditors review those documents to ensure no errors were made. Working with individuals or corporations, actuaries analyze and predict the financial costs associated with uncertainty and risk. These roles require a deep understanding of financial theory, advanced mathematics, and statistics. Working in both the public and private sectors, budget analysts review current budgets, make recommendations for changes, and create a framework for company-wide budgets. They also monitor spending to ensure companies stay within their forecasted budgets. Whether employed by a business, bank, or mutual fund, a financial analyst is tasked with evaluating investment opportunities. These analysts study historical data to make educated investment forecasts. Tasked with analyzing financial documents to find evidence, forensic accountantst support litigation and other investigations. Employers may include police agencies, the government, insurance companies, or banks. Certified Internal Auditor The Institute of Internal Auditors provides this examination and certification to students planning to pursue various areas of auditing. It can be completed in one year. Accredited Business Accountants Administered by the Accreditation Council for Accountancy and Taxation (ACAT), this certification allows accountants to provide financial services to small businesses, families, and individuals. Accredited Tax Preparer Also overseen by ACAT, the Accredited Tax Preparer credential is for experienced practitioners who are focused on individual tax returns. A special emphasis is placed on issues related to the 1040 tax form. Completing a master’s in accounting online is a good option for people looking to increase their salary. A report by CBS Money Watch found that financial advisors — a common role for those with accounting degrees — make an average of $62,700 with a bachelor’s degree. However, professionals with a master’s in accounting earn an average of $78,000, an increase of nearly 20%. Higher rates of pay begin almost immediately upon graduation, creating a wider pay differential as professionals mature in their careers. While education is an important factor in determining one’s salary, other considerations include workplaces and levels of experience. The table below collects data from PayScale featuring expected salaries for accountants, financial auditors, and tax examiners at different stages of their careers. The Graduate Record Examination (GRE) is a standardized test taken by millions of prospective students planning to complete an advanced degree. Comprised of four sections — analytical writing, critical thinking, quantitative reasoning, and verbal reasoning — the GRE is a common requirement for entrance into a master’s in accounting online program. Alternatively, some programs may require the Graduate Management Admission Test (GMAT), which covers analytical writing, integrated reasoning, quantitative, and verbal reasoning. Most testing professionals suggest students spend two to three months preparing for these graduate examinations before sitting for the actual exam. A full range of study materials are available as free resources or paid courses. 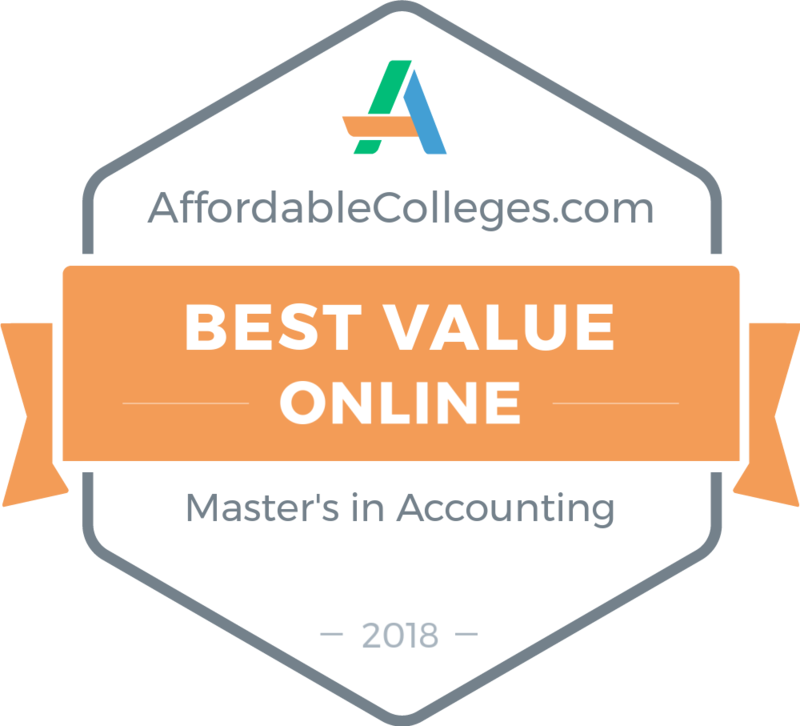 Online master’s in accounting programs may waive GRE/GMAT requirements if applicants have a sufficient GPA and/or professional experience in the field. Colleges and universities in the U.S. are eligible for two types of accreditation: regional or national. Regional accreditation is typically an extensive and rigorous process to ensure schools meet uniform quality standards. Accreditation is a multiple-year process, often with multiple site visits and interviews with faculty, staff, and schools. Approximately 85% of postsecondary schools carry some kind of regional accreditation. National accreditation, conversely, has fewer rules and standards, and schools can gain this certification more quickly. Students who attend schools with only national accreditation may find it difficult to transfer credits or gain licensure, so preference should be given to regionally accredited schools. Schools may also be accredited at the program level. The Accreditation Council for Business Schools and Programs and the Association to Advance Collegiate Schools of Business provide accounting-specific accreditation to individual programs throughout the country. Paying for an education can often be a significant hurdle for students considering graduate school, but the good news is plenty of financing options are available. Prospective students should first complete the Free Application for Federal Student Aid (FAFSA) to identify any scholarships, grants, loans, and work-study programs the federal government might offer. Degree-seekers should then research private organizations, charities, and foundations that provide scholarships to qualified candidates. It is important to consider departmental and school-based endowment funds, as well, which are often available on the basis of need and/or merit. The American Institute of CPAs provides this non-renewable scholarship to five students per year. Eligibility Requirements: Students must have completed a non-accounting degree during their undergraduate career. Provided via RH/Accountemps and AICPA to individuals who demonstrate potential to become leaders in the field. Eligibility Requirements: Students must have completed at least 30 credits of coursework in accounting and have an overall GPA of at least 3.0. Open to both undergraduate and graduate accounting students enrolled on a full-time basis. Eligibility Requirements: Students must have a major and overall GPA of at least 3.0 and belong to an underrepresented minority group. The Government Finance Officers Scholarship awards funds to part- or full-time graduate students aspiring to careers in state and local government finance. Eligibility Requirements: Students must submit a statement of purpose, their plans for future work, and letters of recommendation. This scholarship is open to graduate accounting students pursuing a degree at an Illinois-based university or college. Eligibility Requirements: Open to African-American students pursuing a CPA license or degree.